You are familiar with the word sunburn, if you have ever spent a day at the beach. It can be that bad that can blister your skin. Here you’ll find home remedies for how to treat sunburn, but be aware that the skin damage from the sun won’t be taken away. The burn will go away, but permanent damage to your skin has already occurred. Often, you’ll be exposed to sun and for several hours sunburn won’t show. You won’t even be aware that you need to get out of the sun or get some sunscreen on. 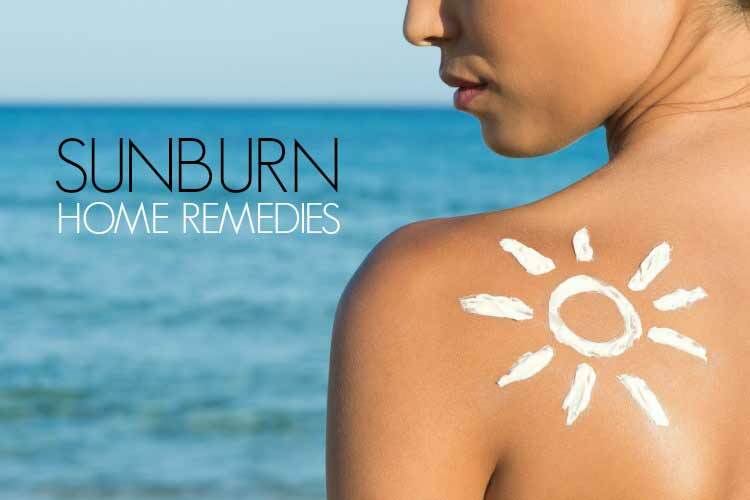 Sunburn can cause freckling, wrinkles and skin cancer. Although the sunburn will be healed, you still may have consequences later on. You won’t know the entire effect for 12 to 24 hours, because the burn will get worse for a while. It is possible to get sun poisoning. If you have any of these symptoms, you should see a physician to advise you how to treat sunburn. Using Aloe vera you can effectively treat sunburn. I experimented with this one summer by applying it on one leg and not the other. The difference between the two legs was amazing. The leg that I used aloe vera on healed much faster. If you have the plant, just open one of the leaves and use the juice. If you don’t have access to the plant it can be cheaply bought in a bottle. It is sold at most drug or discount stores. Apply it to the burned area. Not only will it be soothing, but healing. Do this several times a day to keep the area covered. This method is well known to prevent blisters. It also prevents the peeling afterwards. Use a spray bottle and spray the vinegar on your skin. If you don’t have a spray bottle dampen the skin with a cloth. Apple cider vinegar works the same like white vinegar. Or you can soak in a bath with 2 cups of vinegar for 15 minutes. The cloth wetted with cool water, will lessen the pain of the burn. Also a cool bath helps, but remember that the skin could be injured if you use a washcloth. Afterwards pat the skin lightly with your towel to avoid making the sunburn hurt worse. For a relief from the burning sensation, try to put a few tablespoons of baking soda into a cool bath. Use cool, not cold or hot water. This will help soothe the burn. It can try your skin if you stay in too long. Keep it to just 15 minutes. It will be painful if you dry the sunburned area with a towel. Instead, just let the skin dry. The cucumber slices will help cool the heated area. Cucumber juice will cool you off and help hydrate your body. It is important to keep the body hydrated. If stayed in the sun long enough to have the burn, you need fluids. A sunburn can be drying to the skin. The olive oil will help moisturize the area. It is good to keep the skin moist, because it will be dried out from the burn. A tip from the site Health: How Stuff Works site is to put the moisturizer in the fridge to make it cool and then it will soothe the burn at the same time. The Mayo Clinic recommends aspirin or ibuprofen to help relieve pain. Ibuprofen includes Advil, Motrin and others. Follow the directions on the box. Due to the risk of Reye’s Syndrome Mayo includes that children or teenagers should not be given aspirins. How to treat sunburn with yogurt and oatmeal – Mix ground oatmeal (three tablespoons) with a half of cup of yogurt. Rub it all over the sunburned area and leave on for a few hours. Then clean off. This can be only applied on exposed areas (the neck and face) because of obvious reasons, but it will make you feel some relief. Next time you are going to stay in the sun for long periods, don’t forget the sunblock. A tan is nice, but not from a nasty burn.